Bill Schultz lives in New Berlin and Sturgeon Bay, WI. Bill's popular talks at sports shows and fishing events have turned hundreds on to the tremendous opportunities and excitement of kayak fishing on lakes and rivers throughout Wisconsin. Bill is also a contributing writer for a number of top web sites and magazines. After many years of fishing, Bill discovered kayak fishing in a big way 10 years ago. Sharing his excitement for kayak fishing and chasing smallmouth bass has become a passion for him. 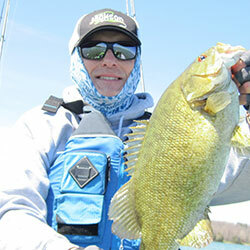 Since catching his first smallie in 1994, he has caught and released 22,500. Bill is on the Pro Staffs for Jackson Kayak, Aqua-Bound/Bending Branches Paddles, St. Croix Rods and Malone Auto Racks. Bill has given kayak fishing seminars at a variety of shows and written numerous articles on kayak fishing. He has shared his expertise with many who are just getting started in kayak fishing and looking for guidance. Bill's talk will look at selecting the right fishing kayak for your type of fishing, look at paddle vs. self-propelled and picking the proper paddle. He'll also discuss rigging and transporting your fishing kayak. An avid bass angler, Bill will touch on rods/reels for kayak fishing, and mention a couple "outstanding" lures and presentations.